UPDATE! : Please see this post. Microsoft has released the language packs and I have updated my Language Pack Downloader tool on Codeplex. They are not publicly available yet. Only through MSDN Subscriptions so I cannot update my Language Pack downloader just yet. Expect an update when Microsoft releases these downloads off to the public. 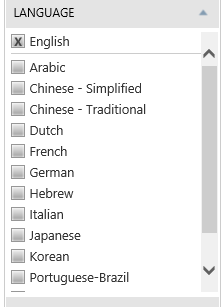 Make your language selection on the quick-launch menu on the left. Apparently, an MSDN pro is not enough. Maybe ultimate only ? Pro i was not aware. I have Premium and it is present. U need the FR language pack? It would be great if you can grab it for me.. I am MVP but that doesn’t help! Let me see what I can do. I am at the spc12 so limited Internet. I will send to an email. Thanks for the information. Are they language packs or full installation in different languages? These are the language packs only. I downloaded three of them. But it doesn’t seem they are language packs. I have English already installed. When I installed one of the packs, it only gives me two options: Repire and Uninstall. After I picked Repire and waited for it to complete, it doesn’t really bring any language related components. What is the filename on the language pack you are trying to install? I tried two: cn_sharepoint_server_2013_x64_dvd_1132447.iso and de_sharepoint_server_2013_x64_dvd_1132442.isofrom the download. After I mounted the iso images, I run the splash.hta or setup.exe – they take me to the same SharePoint 2013 installation UI. These files are about 100MB each and not 2.5GB each. Great, got it. Many thanks! Is it correct that if you are installing language packs on SharePoint Server 2013 you need to install the Foundation ones first then the Server ones? You no longer have to do the foundation language pack installation. I have problems after the installation of this Language Packs, it’s like a css sprite that appear on the top of the Central Administration… someone has the same problem and want to share to fix it… thanks! Could you send me a screenshot of the problem?